Antique Sampler, 1787 Religious Sampler by Mary Ann Shepherd. George III, dated 1787. 1787 Religious Sampler by Mary Ann Shepherd. Framed in a modern, gilt over wood, frame with. Loose mounted over a board with wood and brown paper. The sampler is worked in a silk-like thread on linen ground, in cross stitch and Algerian eye. Meandering floral strawberry border. Colours red, cream, green and blue. Alphabets A-Z in upper case and numbers 1-22. Verses read’ReIigion prompts of> To A Future start> The Last Appear from> Future And From> Fate Where Gods All> Righteous ways will> Be DecIared The bad> Meet punishment> The Good Reward”Some Men get Riches, yet are always> poor, Some get no Riches, yet> have all Things Store’. Signed and dated’Mary Ann Sheperd Work done in 1787′. A scattering of motifs, including a crown and a fruit basket. A couple of holes. A few pale stains. Colours are slightly faded, but still well defined. Stretching is slightly uneven. Frame showing wear and chips, but structurally sound. 12.5ins by 10ins wide. Specialising in genuine antique Majolica, Samplers, Staffordshire Figures and Decorative Arts. Powered by SixBit’s eCommerce Solution. 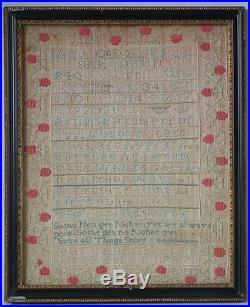 The item “Antique Sampler, 1787 Religious Sampler by Mary Ann Shepherd” is in sale since Tuesday, April 9, 2013. This item is in the category “Antiques\Linens & Textiles (Pre-1930)\Samplers”. The seller is “madelena” and is located in Buford, Georgia. This item can be shipped to United States, all countries in Europe, all countries in continental Asia, Australia. Tags: antique, mary, religious, sampler, shepherd.